The Turtles return (well mostly just Raphael) in an action-packed issue that pits Raphael against a drunken father, young April O’Neil against two ninjas (Foot Clan? ), and Michelangelo against boredom. Most of the issue is dominated by Raphael taking down the drunken father he witnessed hitting his kid at the end of the previous issue. It goes on for just a bit too long in my opinion, and when it’s over, the man just drives away drunken and vaguely agitated. Raphael comes back and talks to the kid and we discover the young man is named, wait for it… Casey Jones. Their story ends with Casey suggesting they go get some food, and when Raphael turns around, Casey is in a hockey mask carrying a large blunt object which may or may not be a cricket bat. It is flashback time and April is hard at work at the lab with the rat and her turtles.The rat the other technicians call Splinter brings her a top secret disk. While she’s looking at that trying to decide what to do with it, ninjas break in and try to steal the turtles and kill her (she didn’t have enough flair [Office Space anyone?]). 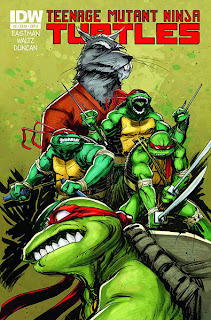 On the run, the ninjas lose the turtles into a sewer and they get covered in a green goo along with Master Splinter. The end of the flashback shows one of the turtles being carried off by a cat that looks suspiciously like an eye-patchless, unmutated, version of Old Hob. And Michelangelo is bored of looking for Raphael. That’s basically the sum of the other three Turtles parts. The art continues to be a solid part of the experience of this comic. I don’t really have much to say about it that I haven’t already said. Overall a strong addition, but a little slower going than the last. Raph’s fight and subsequent encounter with Casey just flat out took too long while the rest of the book moved almost even slower.On a high-point, April DOES punch a ninja in the face.